My most vivid memory from that game is of a Richie Allen home run. It wasn’t just any home run. 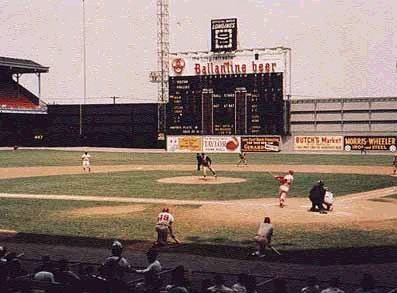 Connie Mack Stadium had a HUGE old-fashioned scoreboard in right-center field. See the picture below, from phillysportshistory.com. Notice the “Ballentine beer” ad running across the top of the scoreboard. Young Richie Allen, who would go on to be voted 1964 NL Rookie of the Year that year, hit a towering home run that night that sailed over the “r” in “beer” and out into the Philadelphia evening. For all I know, that ball hasn’t landed yet… The image of that ball flying out over that humongous scoreboard has stayed with me ever since. I can see it now like it was yesterday. Really??!! I was there. I saw that home run. Even at that age, I knew it was a monster home run that wouldn’t happen every day. But the only one ever? Cool!